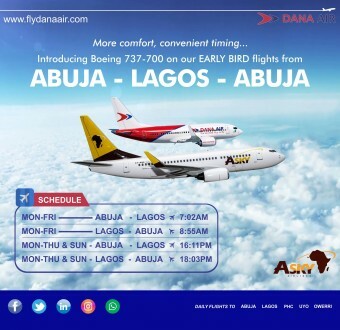 Dana Air adds Boeing 737- 700 aircraft to Fleet ….To commence ‘early bird’’ service from Abuja on 10th September ~ Nigerian news platform bringing you News in Entertainment, Politics, Sports & Lifestyle. The airline in a statement by its Media and Communications Manager, Kingsley Ezenwa, said ‘we are pleased to announce the commencement of our ‘’early bird’’ flights from Abuja to Lagos on 10th of September, 2018. The service will be operated using a Boeing 737-700 aircraft from our partners Asky. According to him, the addition of the B737-700 aircraft to operate its newly- introduced flights between Abuja and Lagos only shows the airline’s commitment to providing its guests more options, convenient timings and more comfort.